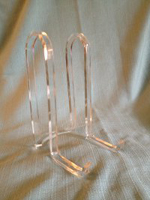 Acrylic knife display stand holds knives securely in a horizontal position. 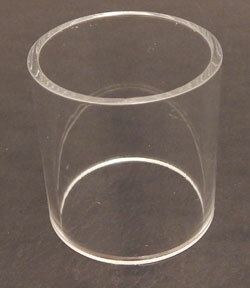 Stands measure 2&quot;h. Clear acrylic construction is highly durable and gives a clean professional look. This acrylic plate display has a lip return to protect plates from sliding. Available for plate sizes 2" to 12" This acrylic plate display works for many different items. 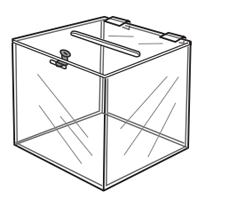 Use it to display plates, tiles, signs, art or any other item that you want to be raised and slanted. Click for more details and sizes. This acrylic ribbon bowl easel is 6"H and has two arms to hold the bowl of your choice. Ribbon design is light weight and economical, without sacrificing display power. This acrylic ribbon easel is ideal for displaying dishes, art or books. Easels are clear and fit easily into any decor. Lightweight and economical design make these easels a must have for your retail display.